Topics: Intranet, Subsidiaries, Social Responsibility, and Emergency Medical Transports. 154 users visit the site each day, each viewing 3.50 pages. Rackspace Hosting Texas is the location of the Apache server. It has 3 DNS records, ns2.cl.bellsouth.net, ns3.cl.bellsouth.net, and ns1.cl.bellsouth.net. 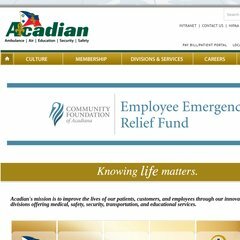 Acadian.com's IP address is 174.143.2.202.